My grandfather, Alfred Oram Lane, known as Orrie, was born in Bathurst in July 1881. His parents were Samuel and Catherine Maria Lane (nee Parker). His teaching career started at Annandale Public School where he was appointed a pupil teacher on 25 February 1897. 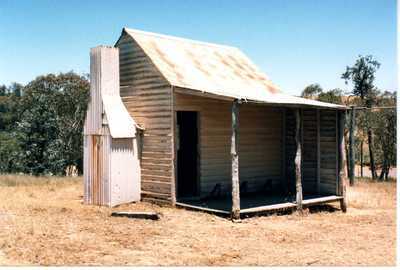 He then taught at 17 country NSW public schools, many as the only teacher, before retiring at Coopernook on 19 July 1945. In 1988 I researched the school files for each posting, held at the NSW State Records Office. One of the most fascinating aspects of these documents is the series of claims he made early in his career for travelling expenses when he moved to a new school. I lived for many years in Canberra and while there visited all 18 sites where the school buildings stand or once stood, so I know what its like to travel today between his postings and all can be done in a few hours by car. On 24 April 1900 Orrie lodged a claim for £2.8.6 ($4.45) for costs incurred in travelling from Sydney to Big Mimosa. He travelled by train to Temora and then by coach to Big Mimosa. His next claim was lodged in July 1903 for £2.17.0 for travel by rail from Sydney to Walcha Road, coach to Walcha and finally “by conveyance to Emu Creek”. In January 1906 Orrie claimed 15/10 for travelling by train from Sydney to the Hawkesbury, steamer to Wisemans Ferry, coach to St Albans and conveyance to Upper McDonald. One wonders what he took with him; suitcases for his clothes and teaching items, and perhaps some sandwiches and drink for the journey. Now comes some more interesting moves. In June 1906 Orrie left Upper McDonald by coach to Wisemans Ferry, then by steamer to the Hawkesbury where he took a train to Sydney to catch the steamer to Tathra, and coach to Kameruka. I wonder how long this journey took. Was it overnight? The claim this time was for £2.14.4. He was only a relief teacher at Kameruka and nearby Candelo for a month and was soon on the road again; coach from Candelo to Tathra, steamer to Sydney, rail to Gunning and finally conveyance to Nelango via Gundaroo; cost £3.14.3. I understand that for such appointments, and being a young single man, Orrie would have been billeted by a local couple who had children at the school. One can imagine either walking with the children each day to school or by horse or dray. Next transfer saw Orrie travel from Nelanglo to Buckajo on 24 January 1907 at a cost of £3.16.9. First he took a coach to Gunning, then a train to Sydney, steamer to Tathra, coach to Bega, and finally a coach to Buckajo. Another aspect about these claims is that Orrie was very prompt at seeking reimbursement, and it appears payment to him was also prompt. 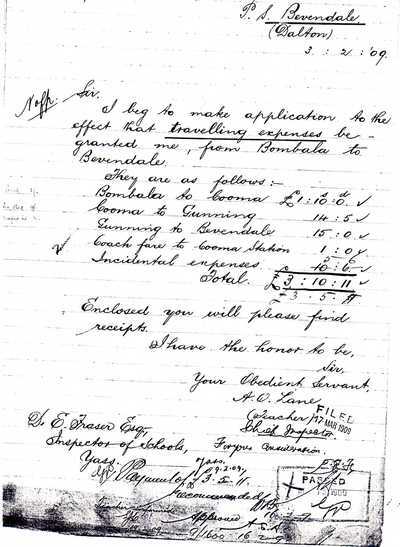 In July 1907 Orrie sought and received £1 as his costs of for making a short transfer from Buckajo to Bombala. Eighteen months later he travelled from Bombala to Bevendale, near Dalton at a cost of £3.5.11; coach to Cooma, train to Gunning, and coach to Bevendale. Orrie had a very good hand as can be seen in his claim for these expenses. At Bevendale Orrie was asked by his local Inspector (supervisor) for an explanation why he took sick leave in November and December 1908 while at Bombala. I quote his explanation “Owing to heavy rain, and the flooded state of the River and two creeks, I was unable to travel the 24 miles to consult a doctor - granted. In May 1913 Orrie received an advance of £3.14.0 towards the cost of his transfer from Frazer’s Knob to Mullengrove. It would seem that while he was enroute in Sydney Orrie obtained some additional books, and as a result incurred charges for excess luggage, ie, to Goulburn 8/2, to Wheeo, 12/6 and to Mullengrove 11/6. He was reimbursed £1.12.2 in July 1913. Much to my disappointment this is the last claim for expenses appearing on the school files, so I can only assume the Department’s filing system changed at about this time, with all claims being filed together. In August 1915, while at Mullengrove, Orrie was asked by his Inspector to explain the reason for recently taking sick leave. He wrote “I beg to state that the cause of my sickness was a bicycle accident, and I was unable to get to town, which is 23 miles distant, to consult a doctor owing to the fact that there was no one to take me in. I therefore had to get along the best I could.” I wonder if the bike was on loan or did Orrie own the bike and take it to future postings. While at Bevendale from 1909 to 1911 Orrie met his future wife Ruby Lillian Russell on a local tennis court. Ruby lived in Sydney and was visiting her Collins cousins. Distance must have made for a difficult period of courtship, and it was not until 20 January 1916 they married in Sydney. Their daughter Merle, my mother, recalled that later Orrie owned a Studebaker car and on country roads he tended to drive in the middle of the road and not worry too much about slowing down for corners. Mum also said that at some locations she rode her pony to and from school; but thats another story.